How to properly winterize your motorbike is an ongoing question for first time riders. I know for me, the first winter I put my bike away for the year, I didn’t even think there were things I had to do. I just stopped riding it and parked it on the front porch. Boy was I surprised when I went to ride it a few weeks later on an unseasonably warm day and it wouldn’t start. 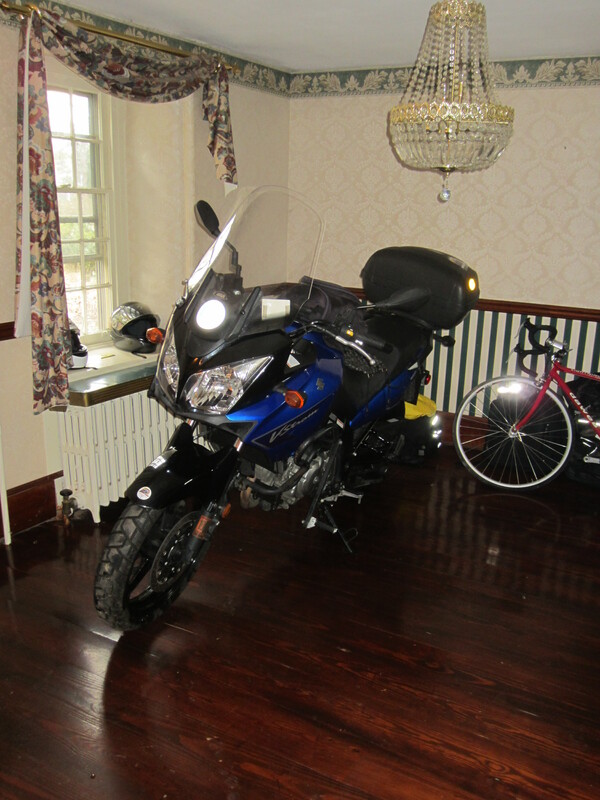 As a bachelor, I have a very convenient and dry place to store my motorcycle for the winter – my foyer! So when I got the offer of a guest blog post from Bobby Cleveland, the Gold Eagle Engine Answerman and spokesman for the STA-BIL® folks, I jumped at the opportunity to publish it as a service to my readers. After getting my bike running again that first year when I didn’t winterize, my mechanic suggested I use STA-BIL® in my fuel tank during the winter to preserve the gasoline and make sure the bike started in the spring. I’ve been using it ever since; it’s good stuff that works. I’ve seen some debate whether it’s really necessary but for a couple of bucks, it’s well worth the investment. And here are Bobby’s suggestions for proper winter storage. With winter rapidly approaching, most of us are bidding farewell to our joyous motorcycle rides in the warm summer breeze and getting them ready to store for the colder months ahead. But, what most aren’t looking forward to is the process of getting this completed. In fact, a national survey conducted by Gold Eagle® Co., an industry pioneer of aftermarket fluids and additives, found that 97 percent of consumers know that properly storing their motorcycles in the offseason will actually help them run at optimal performance come springtime. However, almost 75 percent of people encounter issues when taking their motorcycles out of storage—which means they likely missed some important steps when storing them in the first place. To help prepare for winter storage, Gold Eagle Engine Answerman®, Bobby Cleveland, has some helpful time-and money-saving tips to help ensure you properly prep your motorcycles for storage, so they are ready to rev up come springtime. Step One: Block off a few hours in your schedule to ensure you have time to complete the process. It can take anywhere from 30 minutes to 2 hours, and it’s well worth the time, as you’ll be helping protect your motorcycle from corrosion, rust and other damaging elements and avoid repair costs in the spring. Step Two: Clean your bike thoroughly to remove all residue and dirt from surfaces, so it doesn’t sit all winter long. Using a cleaner like 303® Fabric & Vinyl Cleaner to remove residue that could cause stains if it sat through the cold winter months. Also, using a protectant like 303® Aerospace Protectant will help keep vinyl and leather from cracking in lower temperatures. Step Three: Clean beyond the surface, taking care to clean the INSIDES of your bike too. Fuel problems are a top issue that motorcycle owners run into during storage and it’s important that you complete this step properly, or you’ll face consequences come spring. With this in mind, when winterizing your bike, leave your gas tank full of fuel and add STA-BIL®Fuel Stabilizer. If you’re fuel is fresh, you do not need to drain it, but if you’ve had it more than a month, you should drain it completely and refill with fresh fuel. Once you’ve filled your tank and added a stabilizer (use 2 oz to every 5 gallons of gasoline for storage), you should run your engine for a few minutes to make sure the fuel stabilizer gets into the carburetor and injectors. By filling the tank with fuel and stabilizer, you clean the carburetors and fuel injectors and ensure there is less air in the tank to prevent corrosion. If you leave air in the tank, it creates condensation, which can cause corrosion, so the more you eliminate water in your tank the better. It is also a good idea to use a fogger to coat the inside of the engine when it is stored. You can use STA-BIL® Fogging Oil that you spray into your carburetor to coat the inner lining and prevent corrosion. Step Four: Make sure your battery is properly charged, so you don’t end up with a dead battery come spring. You’ll want to make sure it has at least a trickle charge. Check your engine manual to make sure you are doing this correctly. Step Five: Cover the bike properly and store it in a cool, dry place. This will help to keep any eroding elements away from the surface and keep it in the best shape until you are ready to take it out next spring. Written by Bobby Cleveland – Bobby Cleveland shares his engine knowledge as Gold Eagle’s Engine Answerman. As a former technician, he shares his experience and advice with consumers on how they can obtain greater performance out of all things motor—from power sport vehicles and classic cars to household power equipment such as string trimmers and lawnmowers. Learn more from Bobby at his blog – On the Road with the Engine Answerman.